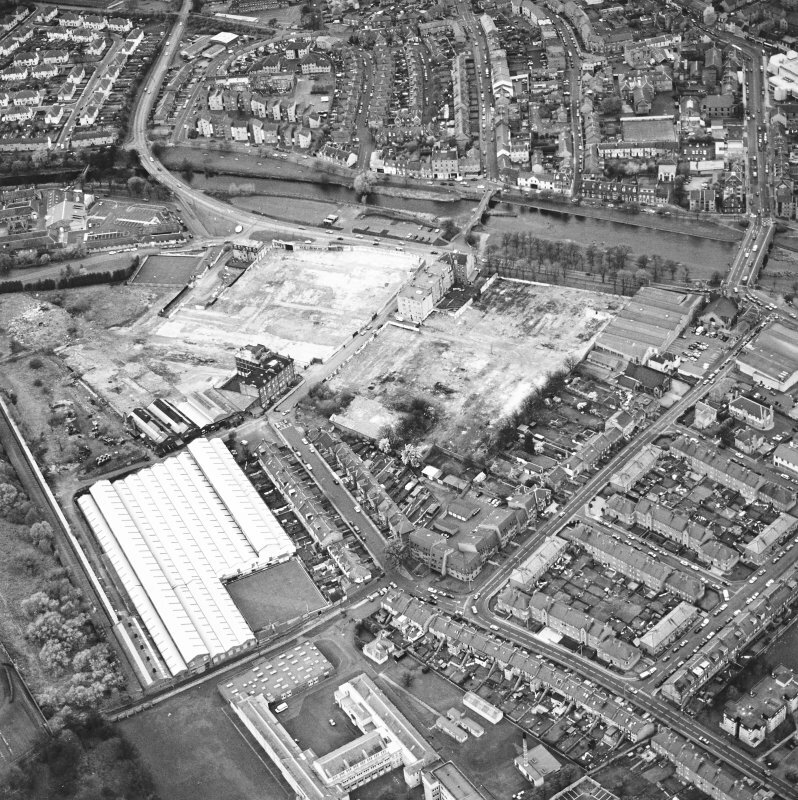 Oblique aerial view of the town centred on the road bridges and footbridges, taken from the SW.
Aerial view of Brunton Ltd wire works, excavation and River Esk bridges, taken from the ESE. 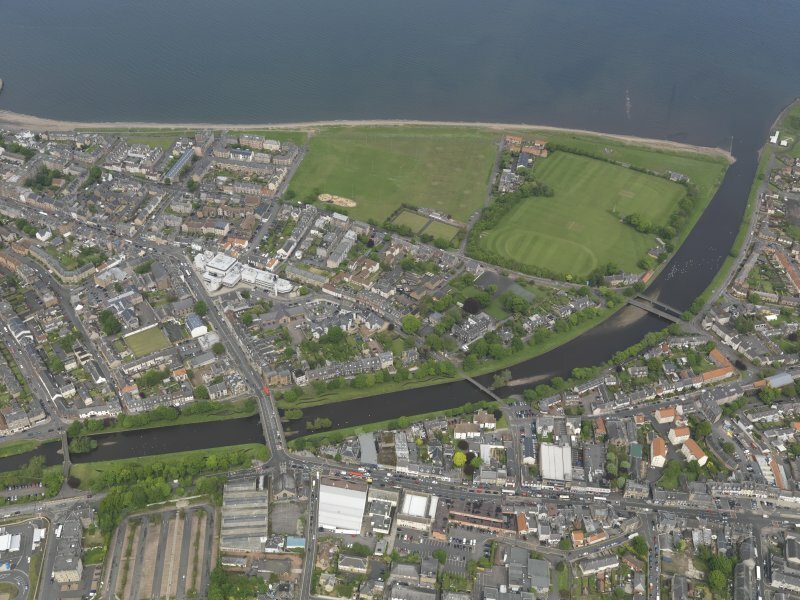 General oblique aerial view of Musselburgh centred on New Bridge, taken from the SE. 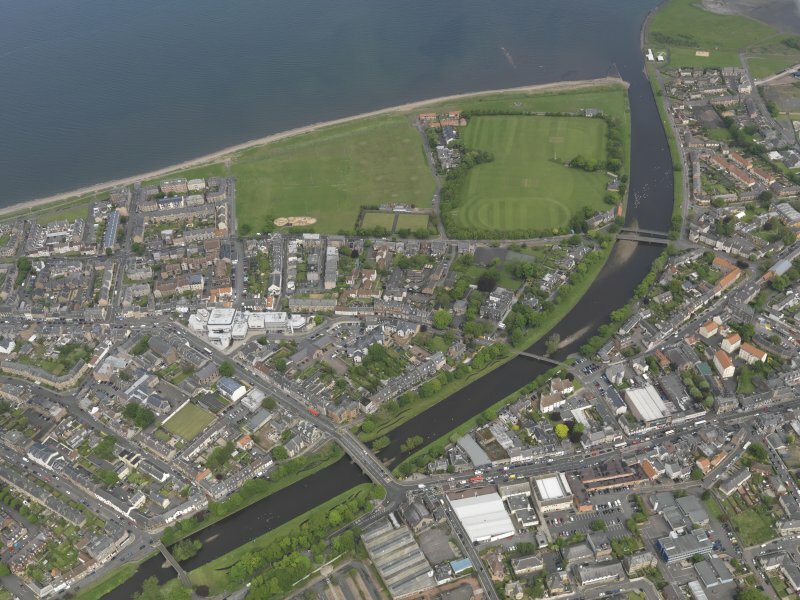 General oblique aerial view of Musselburgh centred on New Bridge, taken from the S.
Aerial view of Brunton Ltd wire works, excavation and River Esk bridges, taken from the NE. 'Old garden at Pinkie burn'. 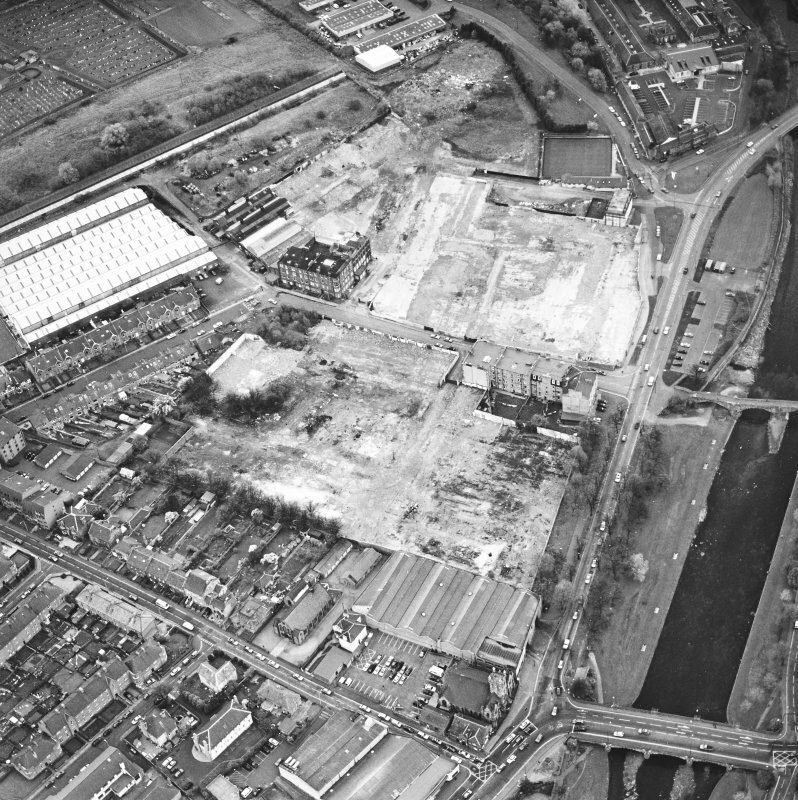 Aerial view of Brunton Ltd wire works, excavation and River Esk bridges, taken from the SE. For (predecessor) Old Bridge (NT 34076 72537), see NT37SW 5.00. RHP 8796 John Rennie 1803 - plans, elevations & sections (photocopy). 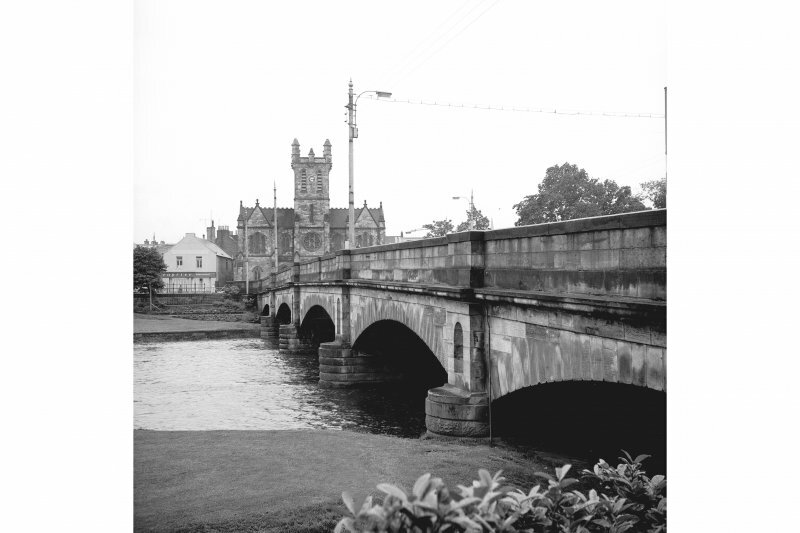 The New Bridge over the Esk was designed in 1806 by John Rennie, with five arches and niched piers over rounded cutwaters. 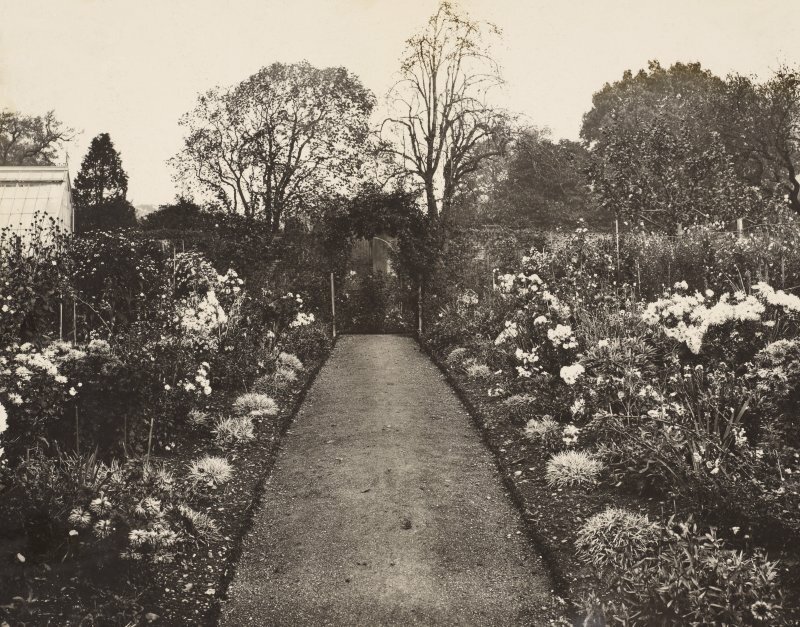 It was greatly widened in 1924 by Blyth & Blyth, without altering its appearance from either side. 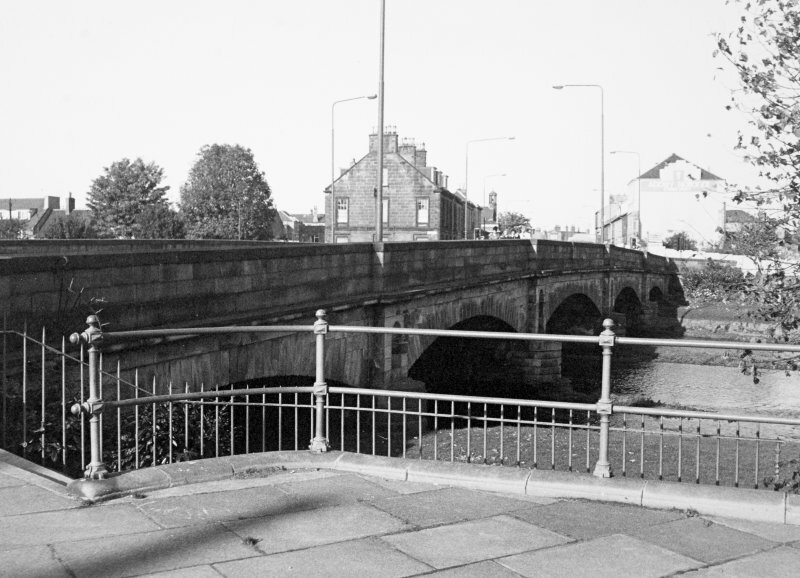 This bridge carries the former line of the A1(T) public road (now the A199) over the River Esk within the area of the town of Musselburgh (NT37SW 409), between Bridge Street (to the W) and High Street (to the E). 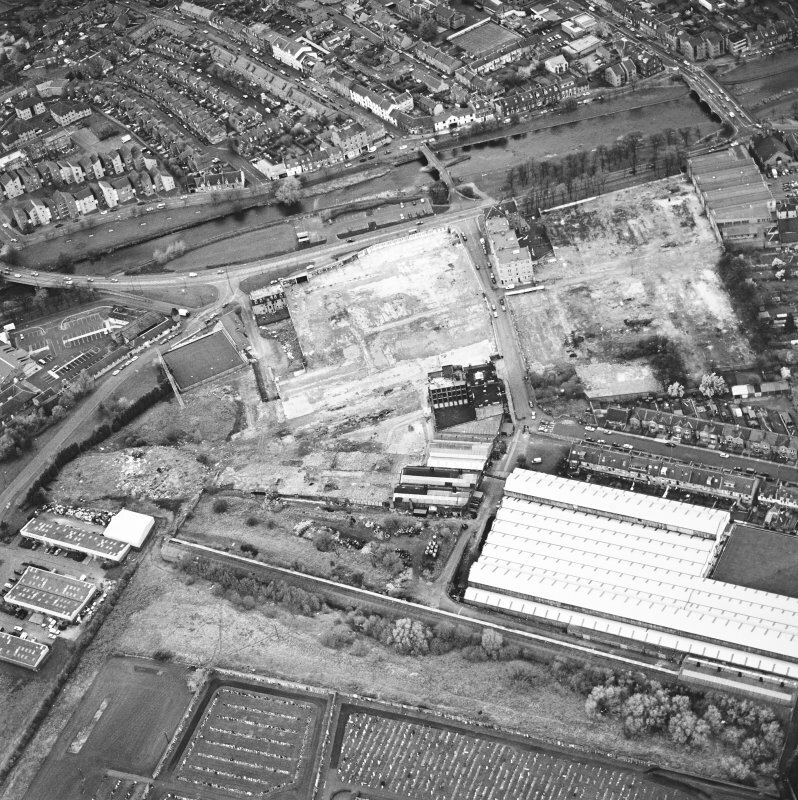 The location assigned to this record defines the centre of the structure, which apparently extends from NT c. 34195 72675 to NT c. 34248 72612.
completed in 1808. It is built of freestone with an original width of 3412 ft before being widened in 1925 on the downstream side to 53 ft, carefully preserving the original facade stone-by-stone as can be seen in the view. A metal plaque on the north parapet of the bridge states that it ‘was built by John Rennie, Engineer, 1806. Repaired and widened 1924–25. 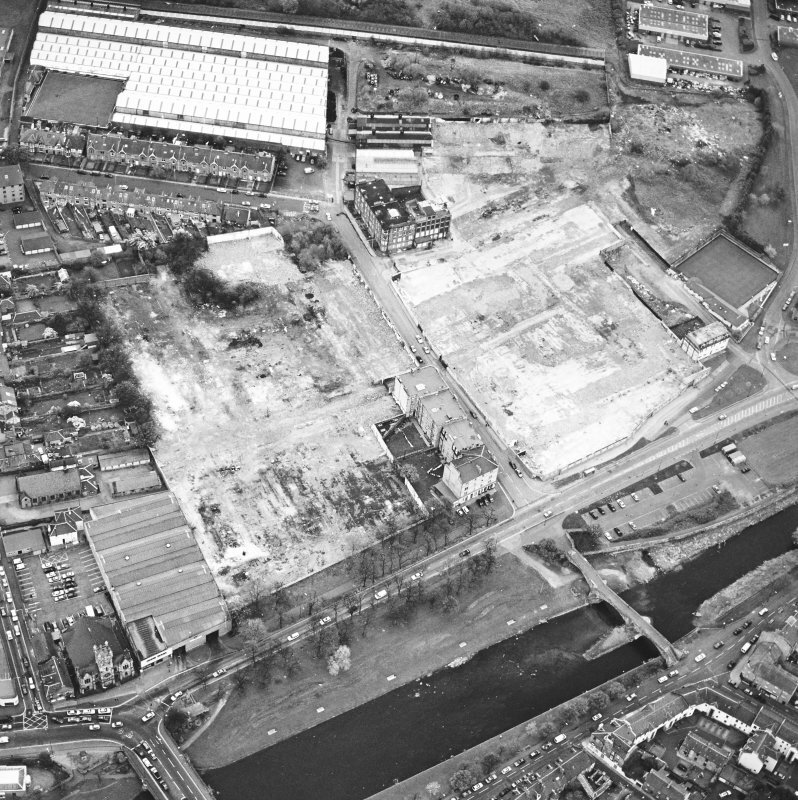 Alexander Mitchell, Provost, Blyth & Blyth, Engineers, John Angus & Sons, Contractors’. 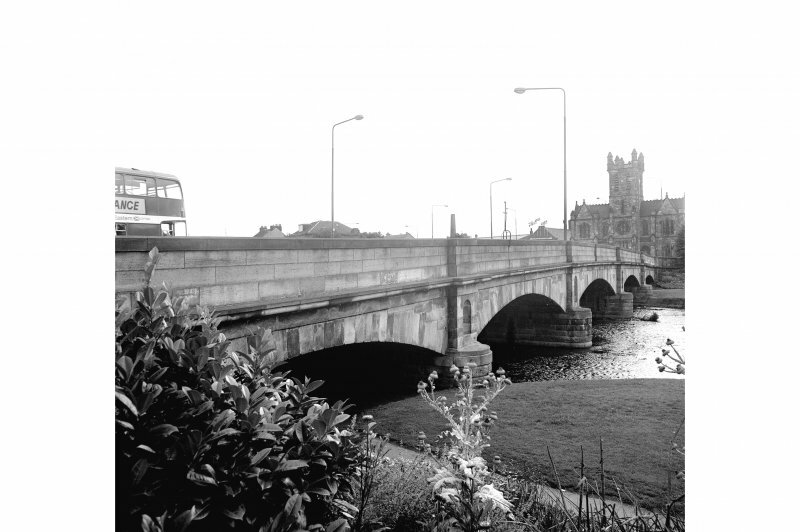 The bridge was, and still is, notable for the low almost flat longitudinal profile of the road about 14 ft above the river, of which people exclaimed when they passed over it that they did not realise it was there! 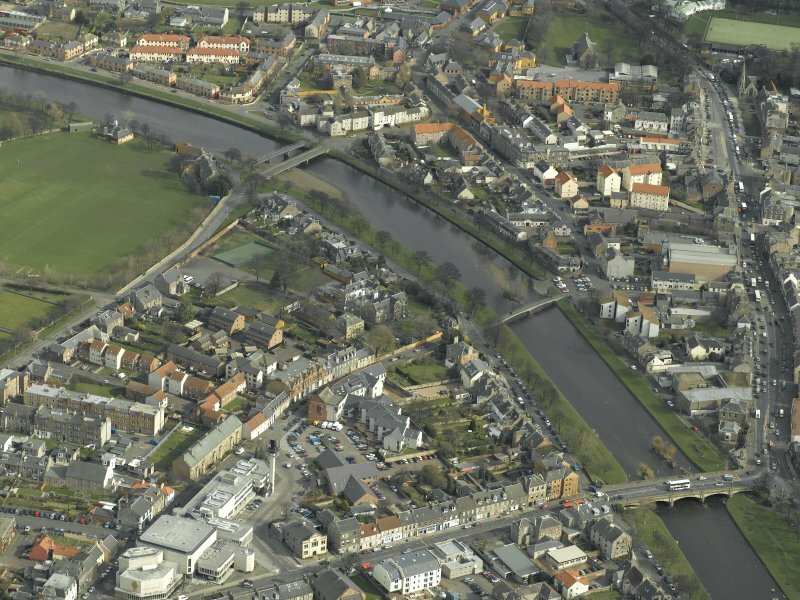 It is a fine example of a Rennie bridge.